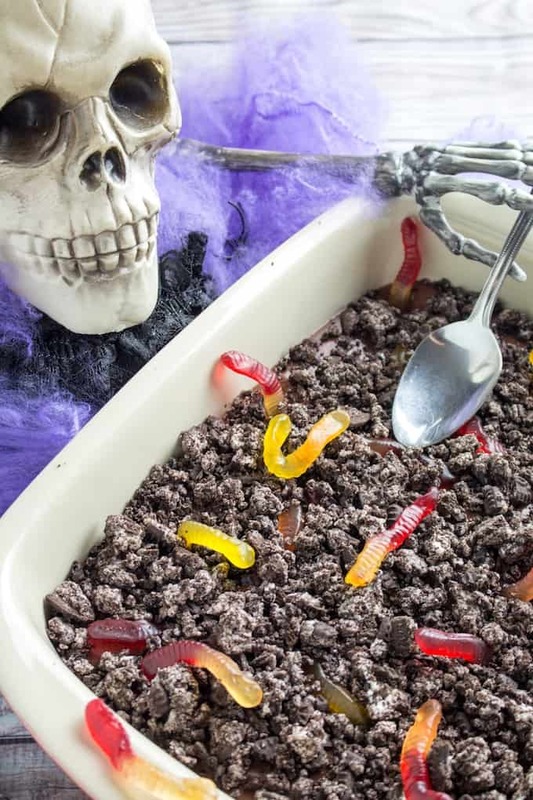 Worms In Dirt Chocolate Pudding Dessert is a fun halloween food you can serve at your next party. Chocolate pudding with gummy worms, topped with gluten free cookie crumbles. 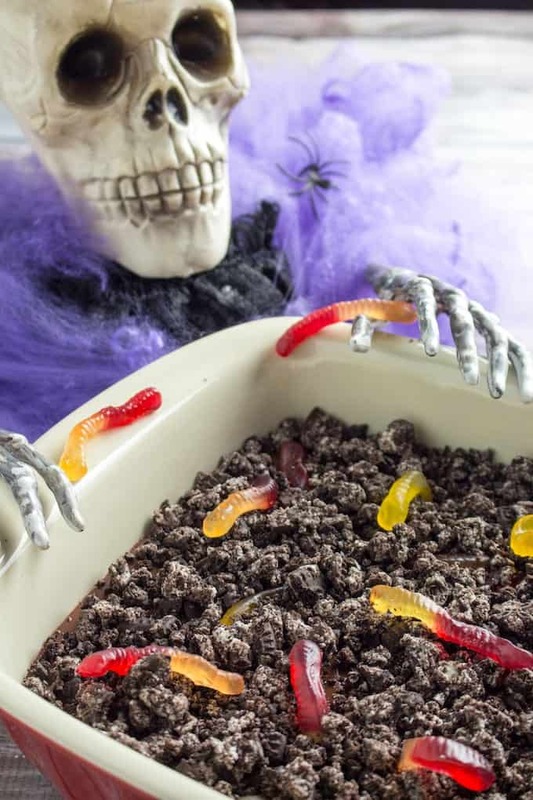 It’s a fun spooky food option for kids, and it’s super easy to make! If you like Worms In Dirt Chocolate Pudding Dessert, you might also love this Seriously Easy Chocolate Avocado Pudding, Easy Chocolate Chia Seed Pudding, and this Cannoli Dip Recipe. 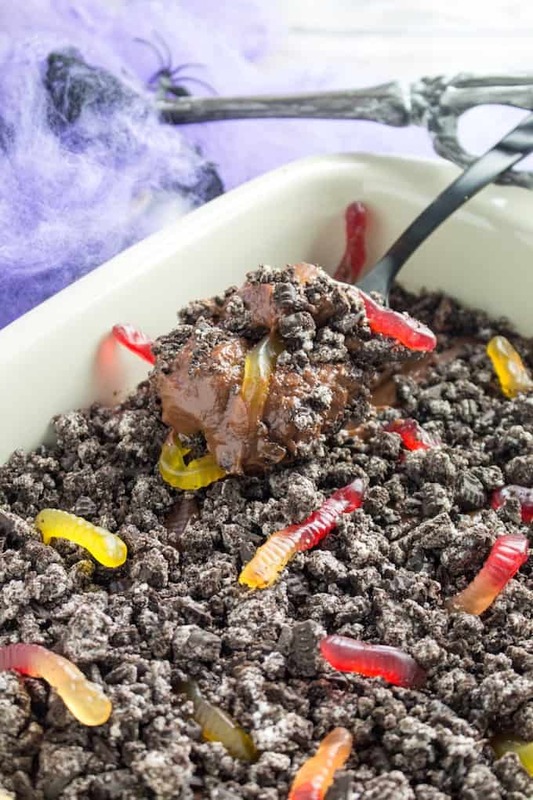 Worms In Dirt Chocolate Pudding Dessert is a spooky food idea to serve at your next Halloween party. 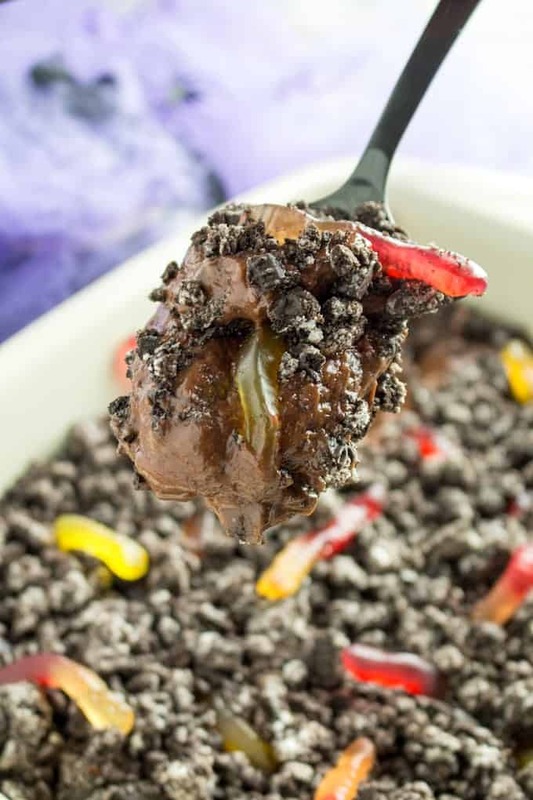 Kids love the chocolate pudding and cookie crumbles, with a gummy worm surprise inside. Plus it only takes a few short minutes to make, and it’s really easy to make in large batches. And this Halloween treat is easy to make gluten free! How do you make dirt for worms in dirt dessert? Place the cookies in a plastic ziplock bag. Take a rolling pin and gently roll it back and forth on the cookies, until they are crushed into small pieces. Be careful not to use too much force, you don’t want to break open the bag. And my favorite way, just place the cookies in the food processor. Pulse until all cookies are crumbled up. Using this method may give you a smaller cookie crumb, so if you want bigger chunks then you may want to use the ziplock method. How long is worms in dirt pudding good for? This worms in dirt dessert can last in the refrigerator for up to 3 – 4 days. I wouldn’t go past that, and it won’t keep outside of the refrigerator. But this means that you can easily make worms in dirt dessert ahead of time, and just pull it out of the refrigerator for the actual party! What pudding do you use for a chocolate pudding dessert? For a chocolate pudding dessert being served at a party, I like to use store-bought instant pudding. If you go this route, make sure the brand you’re using is gluten free. You can also make your own pudding, if you’re motivated! And you can make it a touch healthier at the same time with my chocolate avocado pudding (linked at the top). But I would only use that recipe if you’re making a small amount, as the avocados can add up fast. If you don’t care for chocolate pudding dessert, I’ve also made this recipe using vanilla pudding and gluten free vanilla sandwich cookies (Worms and Sand). This works particularly well if you live by the beach, or if you live in a climate where it’s still hot outside in October. Guests typically get a good laugh out of it! 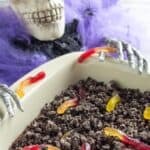 Worms In Dirt Chocolate Pudding Dessert is a fun halloween food you can serve at your next party. Chocolate pudding with gummy worms, topped with gluten free cookie crumbles. It's a fun spooky food option for kids, and it's super easy to make! Prepare pudding as directed (whisk with milk and refrigerate). Once pudding thickens, stir in gummy worms. Pour into a medium baking dish (or serving dish) and spread evenly. Add cookie crumbs evenly on top of pudding. Add a few extra worms here if desired. *Make sure your ingredients are gluten free, as pudding and gummy worms can vary.